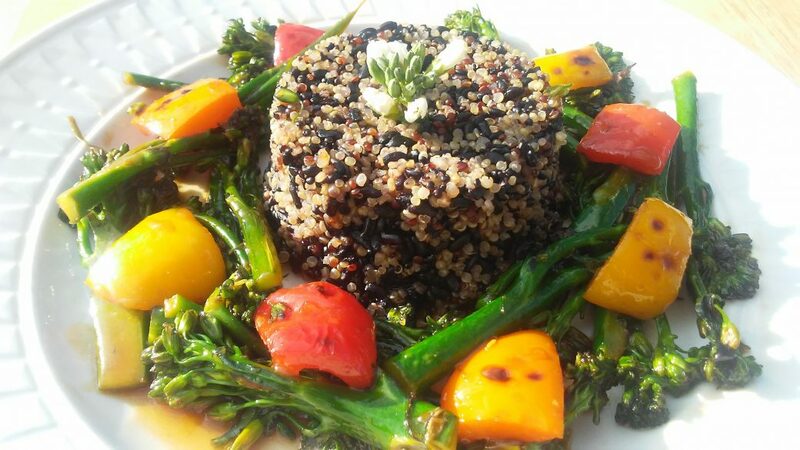 Broccolette, red, yellow & orange peppers served over black rice and Quinoa with a simple Asian inspired garlic sauce. Topped with Broccolette flowers which are fragrant and delicious. This dish is powerfully healing and healthy. This dish is low in sodium. Broccolette is a cruciferous vegetable derived from a cross between broccoli and the Chinese kale called gai lan. Also known by the trade names broccolini and aspiration, broccolette has a milder, sweeter taste than broccoli and features thin, tender stalks that can be cooked whole without peeling. If you haven’t tried black rice it adds an earthy flavor. Black rice is also known as the forbidden rice. It’s an ancient grain that is thousand’s of years old. And it has even more impressive health benefits than most other closely related rice varieties. Not only is it the type of rice that is richest in powerful disease-fighting antioxidants, but it also contains dietary fiber, anti-inflammatory properties, and has been healing properties recognized to stop the development of diabetes, cancer, heart disease, and even weight gain. Note: Black rice turns the water black /purple & takes 10-12 mins longer than white rice and Quinoa to cook. In this recipe, I cooked them in separate pots to keep the color of the Quinoa intact. Both are cooked in zero salt veggie broth. Once they are both done, it will be OK to mix them together with little to no color bleeding. *Ok To Omit, although per serving sodium is very light. 2 Tbsp lemon juice (1/2 a lemon) or more is really love lemon. You can use any combination of any bell peppers you’d like. Saute’ your veggies on high heat in 2 Tbsp of lemon juice. Cook stirring constantly for about 5 mins. Add the sauce and stir. It will thicken in about 10 seconds. Remove heat and serve.